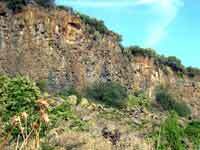 The integral natural reserve of the Simeto lava gorges enter in the regional plan of parks and natural reserves, instituted with the regional law n° 98 of 6 May 1981 and n° 14 of 9 August 1988, approved, with decree by the Councillorship of Territory and Environment, the 10/6/'91. With a total surface of 291,2 hectares (of which 285,5 in zone A, and 8,7 in zone B) falls in the territory of Bronte and, partially, of Adrano, Centuripe and Randazzo interesting so two provinces: Catania and Enna. Created to protect the part of Simeto geologically more interesting, the Reserve protects a long section of the major Sicilian water course in which Etna's lava, arrived to the old river course, has often jumped over it and then the river has been able to dig and erode it with splendid basalt black gorges. Bronte' zone represents the initial tract of the river, and surely, the wildest, where the waters play games of skill and acrobatics with the black lava, while the observer can look astonished at the power that this river, in spite of the enormous damages that our inexhaustible greed has inflicted to its life, continues to display. 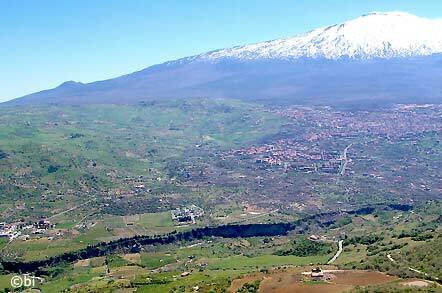 The morphologic, paleontologic, biologic and aesthetic characteristics of the area retain, nearly unaltered, their natural charm, lit up and re-invigorated by particular fauna and flora components and by the constant presence, on the horizon, of the snowy cone of Etna. 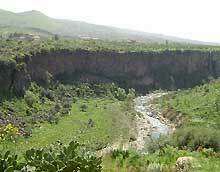 In particular the natural reserve goes from the Simeto' typical aspect, with large alluvial mat of rubble originating from the Nebrodi, to the lava grottoes very similar to the famous Alcantara gorges, with basalt column formations, waterfalls, small lakes, rapids and white waters. 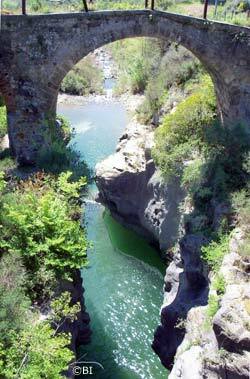 Under the Cantera bridge and the Norman bridge of Serravalle district, the Simeto and the Troina meet high basaltic lava walls, they go over them with a sequel of jumps, rapids and water games, penetrating first with a very narrow duct and a millpond of a few square meters, but mounted between high basaltic walls, to join together, further down, in an uncontaminated scenery. The grottoes start in the borderland between the volcanic rocks and those se­dimentary, in the Cantera - Ser­ra­valle district, where the two ri­vers, Troi­na and Simeto, join toge­ther. The zone of Bolo-Serravalle with its valuable fruits orchards, the Norman bri­dge near an ancient farmhouse with the ex-Church of Placa Serravalle dedicated to S. Francesco di Paola, the remains of an old water mill and the initial part of the erosion is one of the most beautiful in Bronte. Other important historic testimonies belong to the area interested by the reserve, such as the Norman bridge, put across the Troina, the ancient water mill, the small church of Serravalle, dedicated to S. Francesco di Paola, and going on to the road that climbs up to mount Reitano (1.080 m.) in Placa district, a breathtaking landscape of the great Bronte and Etna valley. 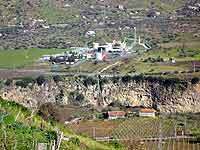 The lava ravine is a very deep cut, dug during millenniums by the Simeto river between the lava of Etna and the sedimentary ground of the mounts of Bronte's valley. 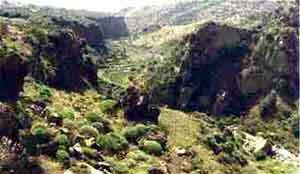 Offers a mini-environment unique, harsh and wild, but also very suggestive and uncontaminated. The photos of this page picture, only in part, the wild beauty of the area and the grandeur of a site still untouched by man. 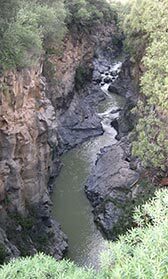 The lava of ancient eruptions that filled the original bed of the river, has been, in millennia, eroded and deeply dug down in a profound ravine, very narrow and with nearly vertical smooth lava walls. 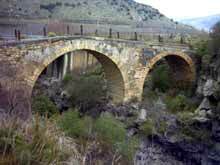 From the two bridges Cantera and Serravalle, put in the homonymous areas, close to Bronte and easily to drive to, is possible to see the erosion's initial part. 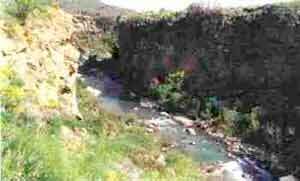 It is a cliff and a wild ravine, called by the folks of Bronte "u bazu ‘a cantira" (the leap of the Cantera), where, under the bridges of Cantera and Serravalle, the Simeto and Troina rivers fall foaming over the lava over the sandstone blocks. The Norman bridge across the river, a very daring piece of work composed by hydro­dynamic piers that hold medieval arcades of a humpbacked bridge, is characterized by the use of local basaltic stones, alternating to ashlars of white tuff, with a chro­matic effect truly particular. 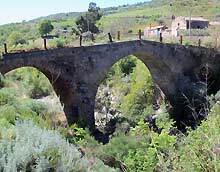 On the bridge used to pass the old road that united the hinterland of Sicily (Troina) to Catania and Messina. Under the bridge, a crack steep and impracticable, initially few meters wide and deep, between eighty and one hundred meters high, squeezed between colored basalt walls, enlarges then, for kilometers, luxuriant of vegetation and animal life, among majestic basalt walls. 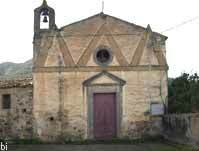 In the photos images of the zone and of the ancient Norman brid­ge of the zone of Serravalle. before by se­di­men­tary outcrop and the ty­pi­cal vegetation that assu­mes par­ti­cu­lar featu­res with the Oleander pre­sence, the bush euphorbia, able to grow and branch out over the lava. Over the river gravel bank can be found the inundations consti­tu­ted both by pebbles of lava, of various color, and by sands, gravel and pebbles of sedimentary origin coming down exactly from the Nebrodi. It is not rare to find amber' peb­bles and shells, light-colored that always attract the searchers and that tell us of a far geologic past. 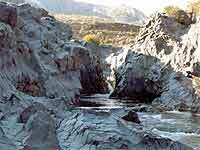 The large stony riverbed is often occupied by typical river bank vegetation: canes and oleanders that in spring assume a magnifi­cent blooming. 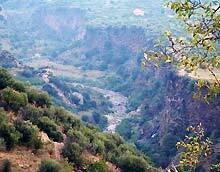 The agricultural landscape is typical of Bronte, with old zones often subjected to floods, chan­ged in fruit orchards, with the very stony ground where the Bronte's farmer has planted vast Pistachio cultiva­tions, and, in some spots, occupied by grazing land steep and degraded, that among the grass cover, the clayey soil characteristics, with large groves, narrow and deep and with steep ridges towards the tops. Around a contrasted landscape and a deeply varied nature, Text3aized tree cultiva­tions that go from the fruit orchards (pears, peaches, etc.) to the clayey pa­stures alternating with steep lava fields cultivated to pistachio, citrus fruit orchards, olive or almon­d trees, vegeta­bles, prickly pears, wheat and cereal fields. The fauna component of this ecosystem comprises some reptiles (The collar snake, the viper snake, the leopard snake, maybe the best looking European snake long up to one meter), the lizards (Ramarro, Lacerta viridis o la Podarcis sicula) that hide among the vegetation or among stones and rocks, some amphibious rare species (the Disco­glosso), some frogs and toads that live near the river (Bufo bufo spinosus and Bufo viridis) Rare and nearly absolutely absent the fish fauna. The birds population comprises several species sedentary and others migratory: it is not rare to see the ash heron or the egret (Ardea cinerea), they make here a brief stop on their way to zones richer of their preferred foods. In the vegetation near the river can be found birds (the Porciglione) less adapt to fly and they find a typical hiding among the canes, some species of birds of prey as the Hawk, the Kestrel and others. It is not difficult to see and meet the Barn Owl, while in the areas planted with more trees are more frequent other species of Owl. The mammals appear as roaming, coming, in the majority, from close by areas: the Fox, the Porcupine, the Curly, the wild Rabbit and the Hare. 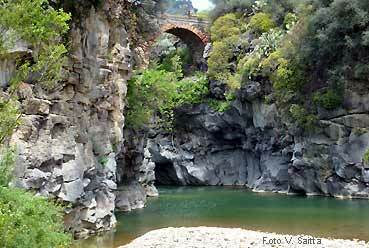 The protected zone of the grottoes is still an uncontaminated natural habitat. The wild nature of the site, the evident difficulty and the dangerousness to build in it, have, till now, preserved and saved from any speculation this wonderful area. 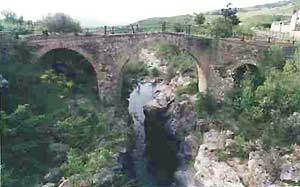 It is at a few kilometers from Bronte and starts at the bridges of Cantera and Serravalle. With due precaution can be visited. Especially in Summer, you can get to the small natural habitat going down on foot along the gravel bank and go on, even with some difficulty, to the bridge of Passo Paglia district. For the safeguard, the conservation and the prote­ction of the par­ticular environmental value of the lava grottoes, of the waterfalls and the small lakes created by the Simeto and of the typical vegeta­tion of the river's banks and also of the specialized fauna component that li­ves in the zone, there are regional safeguard laws. The same laws, however, have not indicated any proper identification of authority. 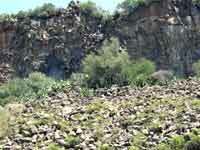 In fact, the land­scape and natural environment con­ser­va­tion defen­se has never been applied properly. The old Norman bridge of Serravalle, now unfit for use, besides being reduced in a state of complete degrade is becoming a true rubbish tip, an open air deposit of unwanted things of any kind.